USC vs Syracuse Football? What to eat? 1) New York City deli fare (e.g., pastrami sandwiches, dill pickles, potato salad, etc.). 2) Orange food/drink: Cheetos (then even our fingers will be orange); orange jello with mandarin oranges, orange juice, orange muffins, oranges, potato-cheese soup (orange after the cheddar cheese is added); orange slices candy, cantaloupe, etc. We thought about doing Chinese take-out, but logistically and cost-wise abandoned the idea. From Wikipedia: The Syracuse Orange is the nickname used by the athletic teams of Syracuse University. The school is a member of NCAA Division I and the Big East Conference. The school’s mascot is Otto the Orange. Teams were previously known (until 2004) as the “Orangemen” and “Orangewomen”. The men’s basketball, football, men’s lacrosse, and women’s basketball teams play in the Carrier Dome. 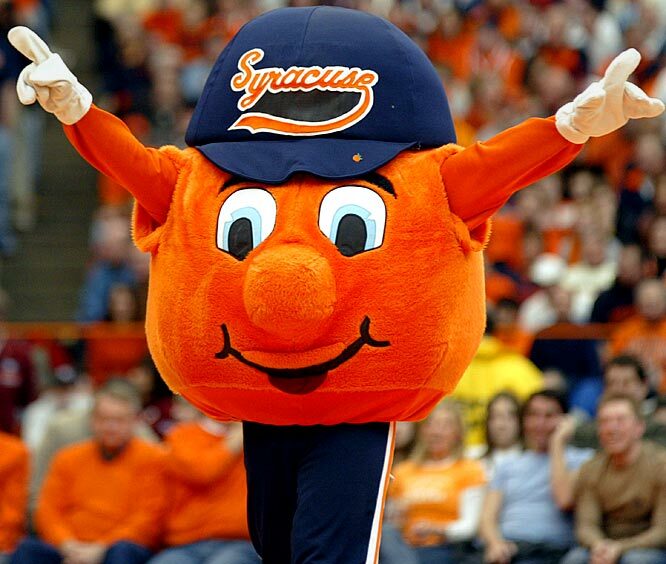 Otto the Orange is the mascot for the Syracuse Orange. Otto is an anthropomorphic orange, wearing a large blue hat and blue pants. Traditionally regarded as gender-neutral, though “Otto” is typically a male name. A team of 4-6 students serve as Otto, each one passing tryouts and a training program. The Syracuse Mascot was originally a Native American character named “The Saltine Warrior” (Syracuse’s unofficial nickname is the Salt City) and “Big Chief Bill Orange”. The character was born out of a hoax in which it was claimed that a 16th century Onondogan Indian chief was unearthed while digging the foundation for the women’s gymnasium in 1928. In 1978, Native American students successfully petitioned the University to discontinue the Saltine Warrior, citing the mascot’s supposed stereotypical portrayal of Native Americans. During the 1978 season, the University introduced a Roman Gladiator dressed in orange armor, but the idea proved largely unpopular among fans, who regularly booed the mascot. For 17 years the university was unable to settle on a mascot until the chancellor appointed a group of students and faculty to create a mascot and logo. The cheerleaders and mascots were at a UCA Cheerleading Camp in Tennessee that summer, and narrowed the field down to two potential names – “Opie” and “Otto”. It was concluded that the name “Opie” would lead to the inevitable rhyme with ‘dopey’, and settled on “Otto”. Later that fall, word got out that the cheerleaders were calling the latest mascot costume Otto, and the name stuck. University administration considered introducing a new mascot (a wolf or lion were likely candidates), but the student body supported Otto. He was recognized as the official mascot of Syracuse University by 1995. Sarah Loguen (1876) fourth African American woman physician in U.S.